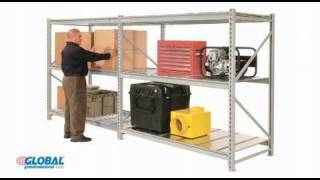 The cost-effective solution when you're looking for heavy duty metal storage racks to handle hand-loaded materials. 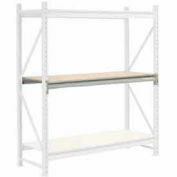 This Starter Unit includes 2 upright frames, 3 shelf levels with 5/8" thick particle wood deck and 5 deck supports per level. 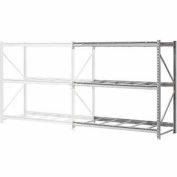 These bulk storage racks offer almost twice the capacity per level as standard bulk racks thanks to the formed step beam frame. Beams attach to frame in seconds without tools. 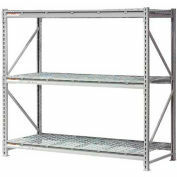 The 14-gauge upright steel frame measure 1-3/4" x 1-3/4" and allows beam adjustment easily on 2" centers. Heavy-duty 12-gauge beams have 3 hooks at each end for positive connection. 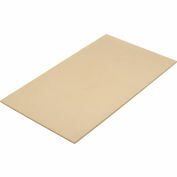 Also available with wire or steel deck, or rack unit alone (supply your own deck). 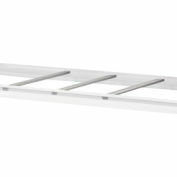 Your review: these shelves replaced old wooden ones that had been constructed over the past 25 years. Now our garage looks great and functions a lot better. 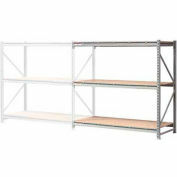 How many wood shelving supports are provided for each shelf in each width: 60", 72"and 96"...and can additional be purchased?